"Delicious and easy. Takes very little time once the sauce has been put together. You can also prepare sauce in advance, freeze it and use it whenever you want to make ribs." Place ribs in a large pot, cover with water and add thyme, oregano, garlic powder, salt and pepper. Bring to a boil and simmer for 40 minutes. Remove from heat and either let stand until ready to barbecue or cook immediately. Meanwhile, mix together the sauce ingredients and blend well. Remove ribs from liquid and brush both sides with the sauce. 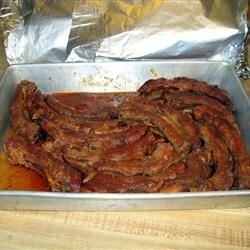 If possible barbecue the ribs 6 to 8 inches from the coals for 15-20 minutes or until brown and crisp. Basting frequently. Serve with remaining sauce. Very tasty! I wish I would have thought of putting spice in the water while boiling ribs years ago! I cut the recipe in half and it was perfect! Mine were not tender at all! This was excellent! My family raved about them. Definitely a keeper. This is excellent!! Just try it!